I had an old ThinkPad R61 motherboard lying around which was just begging to be re-purposed as a music system / home automation thingie. It’s small enough and plenty powerful for the task. Slap it with a touchscreen, USB DAC, some other peripherals and it would be almost perfect. The only drawback is that the power button is located on the keyboard, and basically, there is no way to turn it on without resorting to Wake-on-LAN when keyboard is not attached. 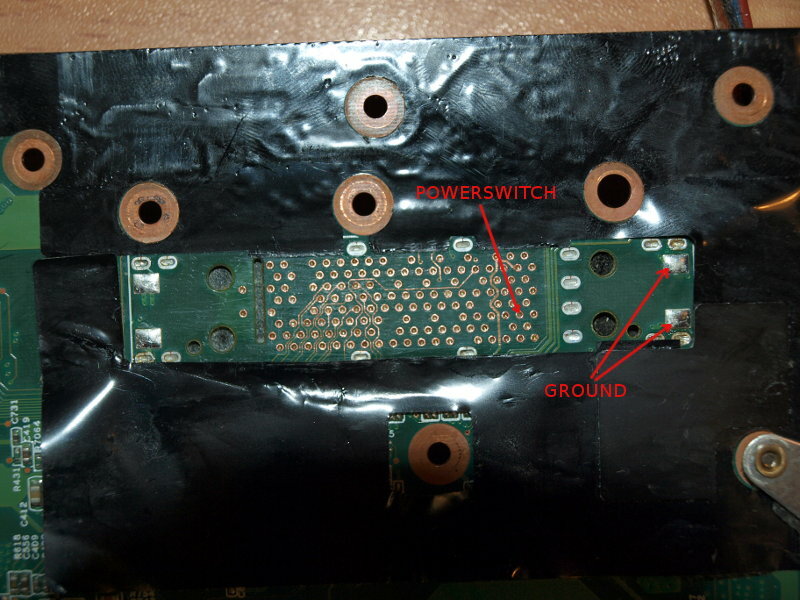 At first, I thought it would be easier or at least less destructive just to use a keyboard connector on a piece of breakout board with a power switch attached to it. 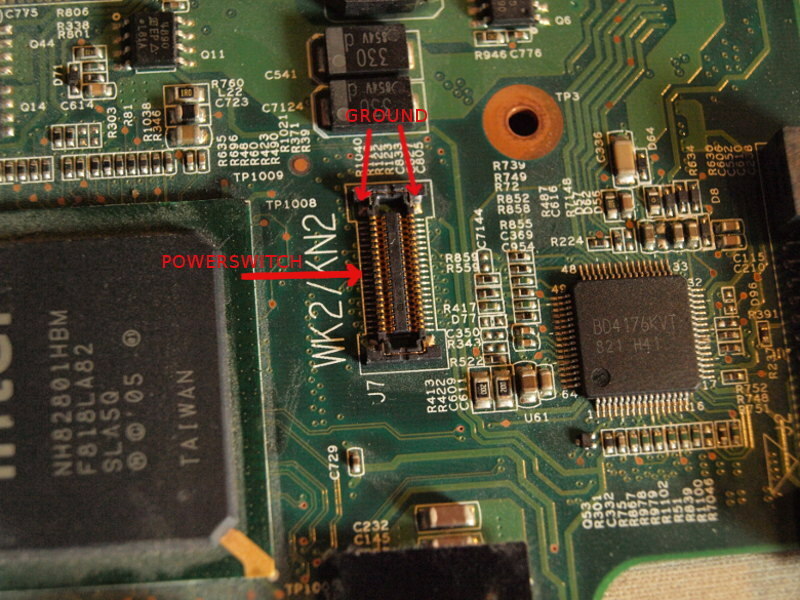 The connector used on ThinkPad R61 (and on plenty of other models of similar age) is JAE AA01B-P040VA1. However, as it turns out, it’s nearly impossible to procure this thing. They seem to be available only in bulk through some Chinese distributors. Yesterday my rather old, but still totally awesome, iriver E30 stopped working – it would just display “designed by iriver” briefly before shutting down completely. Actually, it started behaving erratically a few month before. Occasionally it would un-mount or wouldn’t connect at all. I just blamed it on the OS at the time, but as it turns out, it’s rather a common problem with iriver players and can be fixed by re-flashing the firmware in recovery mode. If you have Windows XP laying around then just download firmware package for E30 and follow the steps bellow. On Windows 7 the updater bundled with E30 wouldn’t work, but the one from E40 firmware package can be used instead. Just overwrite updater.sb and E40.Hex in the E40 firmware package with updater.sb and E30.Hex from E30 package. By the way, an actual Windows machine might be needed for this, it didn’t work for me with VirtualBox under Linux. Take the player apart. 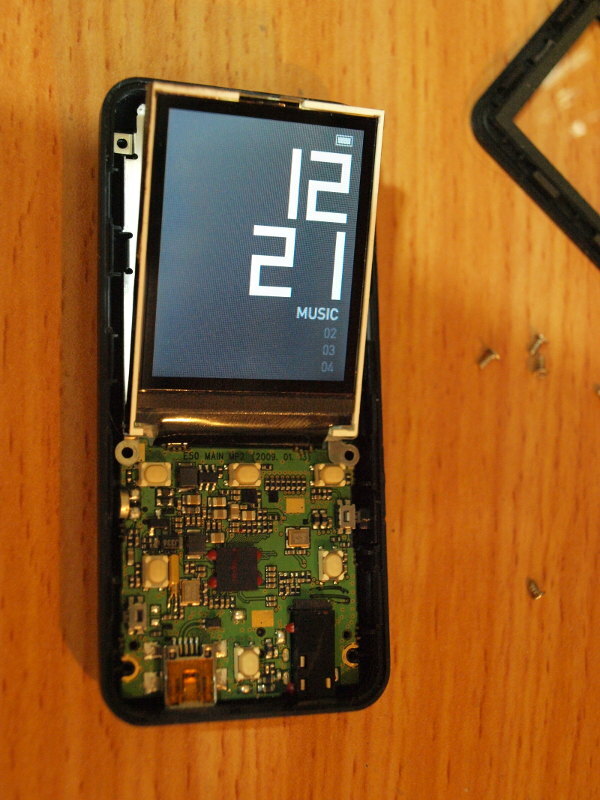 There are four screws on the bottom holding the circuit board down and two under the LCD. You’ll need to lift the LCD to remove those. Desolder the battery. Speaking of which, this could be a good opportunity to replace it with a newer one. I was unable to find a replacement with exactly the same dimensions: 2.8mm thick x 30mm wide x 48mm long (hence the model number PR-283048N), but slightly thicker 303048 worked just as fine. 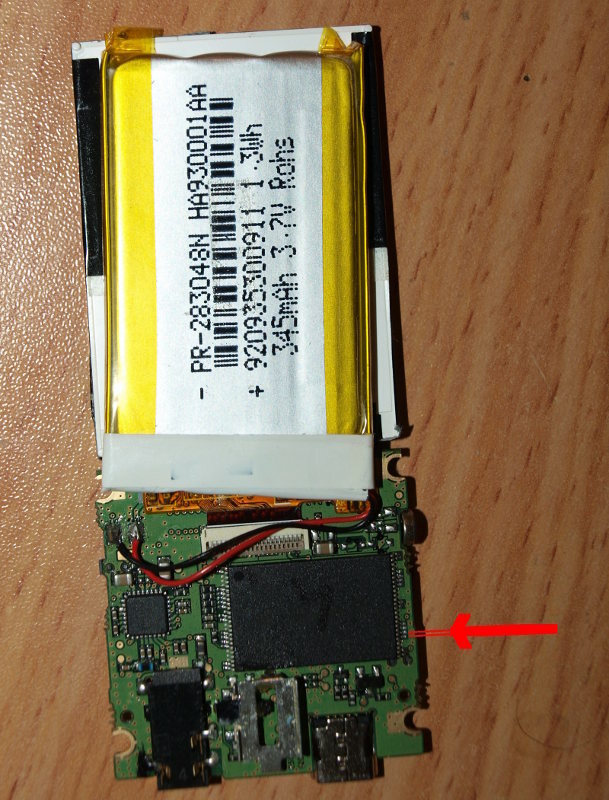 Short out bottom right 5th and 6th pin (see the picture) of the flash memory chip. Just use something conductive, it doesn’t need to permanent. Connect the player to computer. Wait for Windows to install drivers for the newly found devices (should display as HID-compatibale and USB input devices under system manager). Remove the short-out and run StUpdaterApp_E40.exe. Click Start and wait for it to finish. One way for finding matching image within a collection of images (let’s say using SURF algorithm) is to extract features from the query image and all the images in the collection, and then find matching features one by one. While this might work for small collections, it will have horrible performance for collections of considerable size. For a better performing approach we can use Fast Approximate Nearest Neighbor (FLANN) search which was created for the purpose of doing fast nearest neighbor search in large data-sets. For each image in the collection compute descriptors with the algorithm best fitting your requirements. I am using SURF, however depending on the required license, performance or image nuances a different algorithm might be more appropriate. Combine all the descriptors into one big matrix while keeping track which descriptor range within the matrix came from what image. Basically we concatenate rows from all matrices and save the row number where the newly appended descriptors start and end. Build a FLANN index from the concatenated matrix. Compute descriptors for the query image. Run KNN search over the FLANN index. A K-Nearest-Neighbours search computes the distance between a query descriptor and all of the image collection descriptors, and returns the K pairs with lowest distance. KNN search will produce two matrices – Indeces matrix and Distances matrix containing indices of descriptors within the concatenated matrix which had the lowest distance and the distances themselves, respectively. Filter out all the inadequate matches computed in the previous step. Now we can find images matching the query image. Since we know which descriptors within the concatenated matrix belong to what image, the best matching image will be one that has the higher number of descriptors, or more precisely descriptor indexes in the Indices matrix. /// Convenience method for computing descriptors for multiple images. /// On return imap is filled with structures specifying which descriptor ranges in the concatenated matrix belong to what image. /// Computes 'similarity' value (IndecesMapping.Similarity) for each image in the collection against our query image. // find image from the db to which current descriptor range belongs and increment similarity value. // in the actual implementation this should be done differently as it's not very efficient for large image collections. /// Concatenates descriptors from different sources (images) into single matrix. While working on my bi-directional resistor color code calculator, one of the first things I stumbled upon was how to normalize the user supplied resistance value. Such division ensures that substituting an arbitrary value with nearest preferred value wouldn’t exceed the required tolerance. In other words, given a tolerance and an arbitrary resistance value we can calculate the preferred value using the above table. Where R is the resistance, round() is round to nearest integer function, and round2decimal() is round to 2 decimal places function.